EDITORS’ NOTE: According to a source close to Breitbart News and high up in the intelligence community, the Obama administration’s policy following Muammar Gaddafi’s death has been to keep a “low profile” during a chaotic time. For this reason, according to the source, American Marines were not stationed at the U.S. embassy in Tripoli or the American mission in Benghazi, as would typically have been the case. In the spirit of a “low profile,” the administration didn’t even want an American company in charge of private security. Blue Mountain, the British firm the State Department hired, was willing to abide by the “no bullets” Rules of Engagement (ROE), so were a logical fit for the contract. These sub-standard protections for American diplomats were signed by Secretary of State Hillary Clinton in the ROE. The State Department selected a private British firm to provide security at the American mission in Benghazi, Libya in part because it was willing to accept the “no bullets” rules of engagement signed by Secretary of State Hillary Clinton, Breitbart News has learned. The guard, who said he had been hired seven months ago by a British company to protect the compound, said the first explosion knocked him to the ground and he was unable to fire his weapon. Four other contracted guards and three members of Libya’s 17th of February Brigade, a group formed during the first days of the uprising against Moammar Gadhafi and now considered part of Libya’s military, were protecting the perimeter of the compound. One explanation for this guard’s statement that he was unable to fire his weapon is simply that he had no bullets in his gun, which would be consistent with State Department Rules of Engagement for Libya. It is unclear if the three Libyan militia members that comprised the rest of the eight-man perimeter security team were governed by the same rules of engagement as the five Libyan nationals provided by the British firm that holds the security contract at Benghazi. Though it has been confirmed that two of the Americans (Tyrone Woods and Glen Doherty) who were killed on the September 11, 2012 attack at the Benghazi mission were there to provide private security, it’s unclear if they were permanently stationed there and hired by the British security firm or if they were independently hired by the State Department to serve in some other security capacity. In her press briefing on Thursday, State Department spokesperson Victoria Nuland said the American security presence inside the mission perimeter was “robust.” However, she declined to reveal how large that presence was at the time of the attack, whether they were armed and authorized to carry ammunition, and whether they were provided as subcontractors by the British security firm hired to secure Benghazi or if they were independently hired by the State Department. 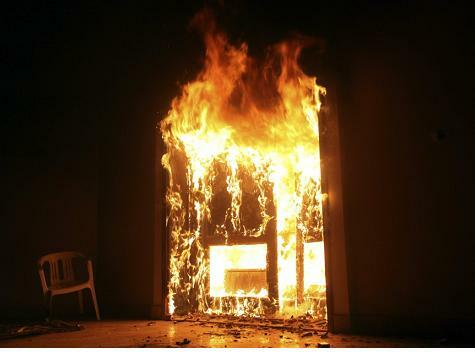 Sources tell Breitbart News that at the time of the the September 11, 2012 attack in which four Americans, including Ambassador Chris Stevens, were murdered, there were only eight security guards for the perimeter and probably no more than four security guards for the interior of the Benghazi mission. Under the State Department Rules of Engagement for Libya, Marines were prohibited from providing security at any U.S. diplomatic installations in Libya, including the embassy in Tripoli and the mission in Benghazi. The State Department denied a Friday request by Breitbart News to obtain a copy of the State Department Rules of Engagement for Libya, the document that contains the answers to the security arrangements at the Benghazi mission at the time of the September 11, 2012 attack. Later that day, Breitbart News filed a Freedom of Information Act request to obtain the document. Usually, FOIA requests are processed within a month. There also were four private security guards, all Libyans, who weren’t armed and worked inside the compound. Interviews with the Libyans indicated there also were four to eight American security guards around the compound when the attack started. As the compound was being overrun, the Americans started returning fire, said Mr. Farraj. “But we were totally outgunned. I called more of the brigade to come reinforce us.” He said a lull developed around 11 p.m. and the Americans and Libyan military appeared to be back in control. At this point, Mr. Farraj said, he believed that the bulk of the American consulate staff were evacuated. But the ambassador was missing and the villa was on fire. The Wall Street Journal puts the number of unarmed security guards provided by the British security firm at four, and places them in the interior of the mission rather than in the exterior perimeter. In addition, the Journal reports that there were apparently just four Libyan military guards on the exterior perimeter of the mission, and though they may have been armed, they were ordered not to fire. It is unclear if this order was given consistent with the State Department Rules of Engagement for Libya. The Journal estimates the number of private American security forces as between four and eight. QUESTION: No, I’m asking whether the State Department rejected an offer from another U.S. agency to provide greater security for installations and people in Libya anytime over this calendar year. MS. NULAND: Well, you will not be surprised if I am not going to speak about the internal deliberations that the U.S. Government has or that the State Department has with its brother and sister agencies about how the U.S. responsibilities for security are carried out. QUESTION: Last question: Very specifically, again, at any time in the last six months did the State Department make arrangements with one of these private security contractors to evaluate our security situation in Libya? And did, in fact, such a contractor undertake an assessment of the security situation in Libya for our installations there? MS. NULAND: I can’t speak to that specifically. I can tell you that at no time did we contract with a private security firm in Libya – at no time. We did have some individual contracts with individual security guards, as you saw and as the Secretary spoke to. As Obama’s Libya narrative of a spontaneous attack based on a film begins to unravel, the cover-up begins. But when all signs point to a foreign policy failure of the highest order, hopefully the public, particularly the people who lost loved ones that day, will get the investigation they deserve. Breitbart News has asked a spokesperson for the State Department if it considers a private American security force of between four and eight as “robust,” but the State Department has not responded.